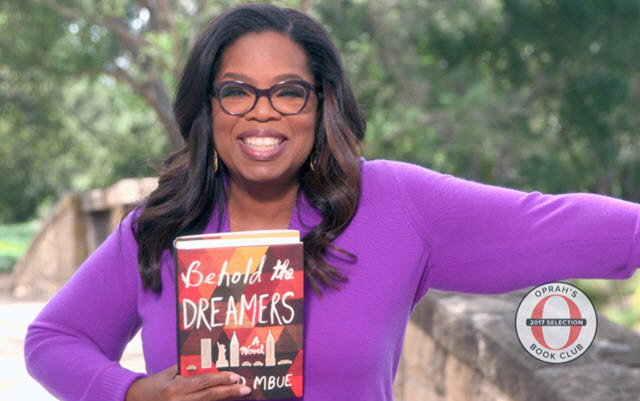 Oprah Winfrey has chosen Beyold the Dreamers by Imbolo Mbue as her latest Oprah's Book Club selection. The selection is an honor for any author. It is extraordinary for Imbolo because Beyold the Dreamers is her debut novel. The novel also won the 2017 PEN/Faulkner Award for fiction. The novel follows a young immigrant family (a Cameroonian couple) making a new life in New York just as the Great Recession hits. It also follows Clark Edwards, a wealthy executive. Oprah says the book is "beautifully written." She says it touches issues our society is grappling with today, including "race and class, the economy, immigration" and the "dangers of us versus them mentality." Imbolo was a guest on CBS This Morning. She was shocked to get a phone call from Oprah because she was expecting a call from CBS's book department. She says she "totally lost it" when she discovered it was Oprah calling her. Imbolo says she became a writer after reading an Oprah's Book Club pick.